A series of minigames that require the NES Zapper to play. Shoot at moving targets with limited ammo. In all the games you start on Round 1 and can go up to Round 99, and you start each game with 10 credits. A misplaced shot will make your number of credits decrease, or shoot Diamonds to gain more. You can take part in the Fun Follies tournament of all the games, plus three games exclusive to this mode. The hunting dog from Duck Hunt appears as one of the hosts of the game. 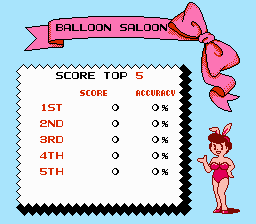 In the Balloon Saloon game he will pop up and taunt you from Round 3 onwards. It you shoot him he gets angry and covered in soot, and the shot counts as a miss. The music on the scoreboards is based on the name entry music from several VS. Multisystem arcade games. 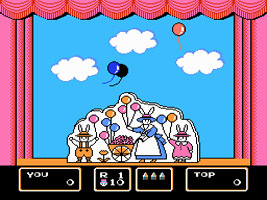 The music appeared in all the VS. games composed by Hirokazu "Hip" Tanaka, and so he is presumed to have composed the soundtrack to Barker Bill's Trick Shooting as well.